The following is an excerpt from my ebook, 6 Medicinal Plants of the Methow Valley. This brand new ebook has articles about wild roses, yarrow, violets, arrow leaf balsam root, sagebrush and arnica. I've also included recipes for each plant. You can instantly download your entire copy of the book when you sign up for my newsletter here. Sagebrush is a common shrub in the western United States. In many areas sagebrush covers the land as the most visually dominant species. It grows in the Steppe habitat. In the Methow Valley most of the valley floor is referred to as the sagebrush steppe due to the ubiquitous nature of this plant. Sagebrush provides food and habitat for a variety of species, such as sage grouse, pronghorn antelope, gray vireo, pygmy rabbit, and mule deer. Sagebrush also provides important habitat for other plants. It provides shade and shelter from the wind. It also brings up water from deep underground, and some of this water then supports neighboring plants. The shrub has silvery grey foliage and has both evergreen and deciduous leaves and yellow flowers that bloom in the fall. It has a shallow network of roots as well as a deep taproot that allows it to thrive in arid conditions. Sagebrush is strongly aromatic. One of my favorite scents is the perfume of sagebrush in the air after a summer rain. Please note that while this plant was sometimes used internally, there are potentially toxic oils in the plant that can be harsh on the liver and digestive system. When taken in too high of a dose vomiting will occur. I mainly use this plant externally in a variety of different applications. Sagebrush was widely utilized as medicine by many First Nations peoples. In Daniel Moerman’s book, Native American Ethnobotany, there are several dense pages dedicated to this plant. Rather than list a comprehensive review of Moerman’s work, I’ll highlight some common uses. 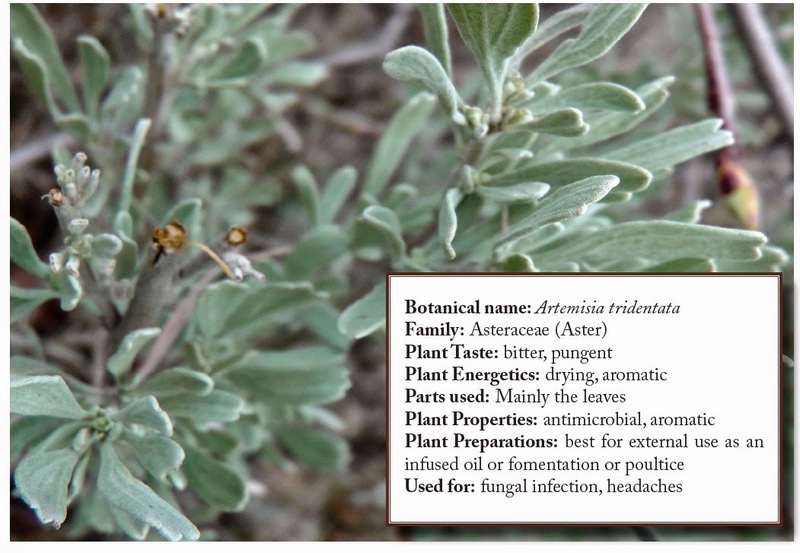 Sagebrush was widely used for headaches. Sometimes a fresh poultice was put on the head, other times a decoction was poured over the head. I read a couple of accounts of the fresh leaves being placed in the nostrils to ward off a headache. It was also used as a general anodyne for relieving rheumatic pain or pain caused by trauma. For this purpose it was used as a soaking herb either in a full bath or as a foot soak. Like its cousin, the white sage of California, it was widely used in ceremonial rites as a smudging herb. It was used both internally and externally for cold and flu symptoms. Taken internally it was used for sore throats, as a diaphoretic for fevers and for congestion. It was even used for tuberculosis. Externally it was used as a chest poultice for pulmonary congestion. It is strongly antimicrobial, especially antifungal and was used for all sorts of infections such as athletes foot, dandruff and for baby’s diaper rashes. Sagebrush was also commonly used for digestive complaints. There were many entries for using sagebrush for stomach cramps simply by chewing on one leaf. It was used by a variety of different nations as an antidote to poisonous bites, including water snakes and fire ants. I love to use this aromatic sagebrush medicine. I only use it externally but I’ve used it in a variety of way. It infuses into oil really nicely and I often use it in my homemade deodorant. It can also be made into a salve; I often combine it with cottonwood and use it for fungal infections and scrapes. I have yet to use it as a powder for skin fungal infections but that is something I want to try. Sagebrush was commonly used for making a friction fire. The bark and wood were used to make clothing, shoes, and bags. The strong wood was sometimes used in making structures. The Thompson Indians used the wood to smoke their hides. Sagebrush leaves are too bitter and, as I mentioned, potentially toxic, to be used as food. However, sagebrush seeds have been used as a famine food. They were harvested, then ground to be used as a flour. Sagebrush is a dominant shrub of the western US, especially in the Great Basin areas. It provides important habitat for both plants and animals. It has long been used for medicine and for tools and can continue to be an important medicinal plant for us today. If you live where this plant is abundant I highly recommend getting to know it better. Harvesting and making medicine with it surrounds you in its wonderful scent. A delightful plant to get to know.